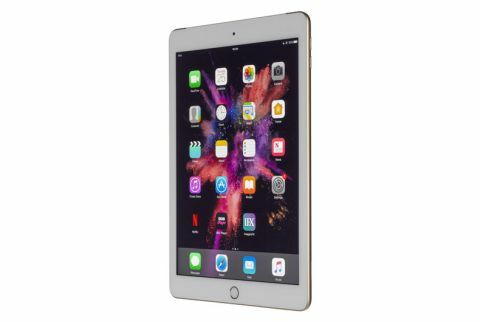 Apple iPad 9.7in (2017) review | What Hi-Fi? This Apple iPad 9.7in (2017) tablet replaced the iPad Air 2, which, at three years old, was begging for a refresh. The Apple iPad (2017) may not set off any fireworks, operating on a ‘more of the same, but better’ ethos – but what it does, it does very well indeed. Naturally, theres's now a 2018 iPad, but if you're in the market for a bargain, this could do the job. At this point in an Apple review, we usually talk about how much thinner the new product is. Except this time, Apple has gone the other way. This iPad is a little bit thicker (7.5mm compared to the Air 2’s 6.1mm) and a tad heavier at 469g instead of 437g (for the wi-fi only models). But we’re talking tiny fractions here and, overall, the difference is barely discernible when holding both iPads. The design is otherwise identical to its predecessor: sleek, solid, and beautifully crafted out of premium materials. It’s light yet sturdy, and the ideal size to carry around on commutes or around the house. There’s little else that’s changed in the iPad’s design, and that might come as a disappointment to anyone expecting exciting new features. TouchID fingerprint, two speaker grilles at the bottoms and, more importantly, the 3.5mm headphone jack all return. You get the same three finishes – gold, silver and space gray [sic] – and they come in 32Gb and 128GB versions. What is new, however, is the A9 chip at the heart of the iPad. The A9 chip was first introduced in the iPhone 6 and 6S, and it’s a big step up from the Air 2’s 8X. The A9 chip is more powerful, supports 64-bit architecture and makes everything from surfing the internet to playing graphics-heavy games as speedy and stutter-free as possible. Apps launch swiftly and without hesitation, swiping across the screen is super-smooth, and features such as split-screen work seamlessly. It’s a fast, intuitive performance that makes the iPad lovely to use. The iPad’s 9.7in Retina screen hasn’t had too much of a facelift, either: it retains its LCD screen with 2048 x 1536 resolution. So we’re not getting the specs or nifty features of an iPad Pro, such as True Tone, but it’s still a reliably sharp and well-detailed picture. But it has improved. The new iPad is noticeably brighter than before, has richer colours and more solid blacks. Pull up any website and you’ll find white backgrounds look starker and cleaner. It makes the Air 2’s screen look slightly blue-ish and muted by comparison. The blue icons in iOS 10’s interface are punchier on the new iPad, and the enchanting world of Monument Valley is awash with vibrant, layered colours. Fire up an episode of Doctor Who on BBC iPlayer and you’ll find the blacks solid and more convincing, and colours that are deeper and lusher. There’s more crispness to the edges of objects, too. Importantly, it retains that same well-judged balance: plenty of punch and subtlety to the colours, but without egging it too far or looking washed out. It’s worth noting this iPad ditched the anti-reflective coating found on the Air 2 and the Pros – which is a shame, as it feels like a step backwards. However, it really only becomes a problem when trying to watch anything in bright sunshine. Whether you’re caught up in the tense soundtrack of Stranger Things or listening to a podcast, the iPad sounds clear and detailed. Dialogue comes through cleanly with enough detail to convey emotion, instruments gel together with precise stops and starts to each note, and there’s a good sense of rhythm that keeps music flowing. In short, it’s similar in character to the general iPad and iPhone family sound. Of course, a lot of what you hear depends on how good the headphones you’re wearing are. There are no headphones in the box, and we’d recommend investing in something in the decent-yet-affordable bracket – such as the AKG Y50s – to really get into your Netflix binge sessions. We’re disappointed that the four-speaker layout of the iPad Pro hasn’t been carried over here as it really makes a difference when watching shows without headphones. The iPad’s own speakers are okay, but a touch too thin to be truly enjoyable. The best thing about the new iPad at launch was arguably its pricing. The base 32GB wi-fi model started at just £340 (or £430 for wi-fi and cellular), while the mammoth 128GB version cost £470 (or £560 for wi-fi and cellular). That’s pretty competitive by Apple's standards. And now, you should be able to find it cheaper. There are more hidden benefits. Despite the brighter screen and power-hogging apps, we find the iPad lasts longer than Apple’s claimed 10-hour battery life. Even after watching multiple shows, playing games and browsing the internet, it takes a couple of days before the iPad needs a charge. The iPad comes with Apple’s iOS 10 installed and you get all the perks – App Store, Apple Music, AirPlay, Siri – that come with it. You even get Apple Pay, although using your tablet as a wallet seems rather cumbersome. For those who use their tablet as a camera, the main 8MP and front-facing 1.2MP for FaceTime now come with support for Live Photos. Pictures are decent, although we’d still opt for using our smartphone when it comes to taking snaps. You can also shoot 1080p HD videos using the rear camera. Some might be disappointed by the lack of 4K or HDR support on this iPad. Samsung’s Galaxy Tab 3 tablet now supports HDR10, while Sony’s Xperia Premium XZ smartphone features a native 4K HDR screen. This feels very much like a bare-bones iPad update. It’s Apple simply doing a bit of housekeeping: dropping the ‘Air’ label, fitting in a fresh engine and streamlining a well-established product. There’s nothing here that we’ve not seen before. However, this iPad is lovely to use, its improved picture is perfect for watching TV shows and films on the go, and it continues to give you that elegant and intuitive tablet experience we’ve come to expect from Apple. The new 2018 iPad offers HDR support and a cheaper entry price for a worthwhile upgrade but if you see a good deal on this 2017 iPad, you could pick up a bargain.